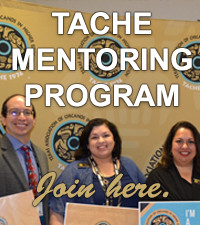 Subscription and publications to our e-newsletter "Noticiario"
Institutional Memberships are eligible to post job announcements to the TACHE job board. Click for job posting guidelines. A Student member is a person enrolled in any public or private higher education institution. Cost is $10.00 annually beginning September 1 and ending August 31. If you are signing up multiple members, please email [email protected] with the complete list of members under your order. An Associate member is a person who shares the purposes and goals of the Association, including public school administrators, teachers, and/or staff from Pre-Kinder to 12th grade. Cost is $30.00 annually beginning September 1 and ending August 31. If you are signing up multiple members, please email [email protected] with the complete list of members under your order. A Professional member shall be an employee for a public or private higher education institution or agency. Cost is $40.00 annually beginning September 1 and ending August 31. If you are signing up multiple members, please email [email protected] with the complete list of members under your order. An Institutional member is any public or private higher education institution or agency that supports and furthers the goals of the Association. Institutional members may include up to five (5) Professional memberships. Cost is $500.00 annually beginning September 1 and ending August 31. Please email [email protected] with the complete list of members for your institution. An Institutional member is any public or private higher education institution or agency that supports and furthers the goals of the Association. Institutional members may include up to ten (10) Professional memberships. Cost is $600.00 annually beginning September 1 and ending August 31. Please email [email protected] with the complete list of members for your institution. An Institutional member is any public or private higher education institution or agency that supports and furthers the goals of the Association. Institutional members may include up to fifteen (15) Professional memberships. Cost is $700.00 annually beginning September 1 and ending August 31. Please email [email protected] with the complete list of members for your institution. An Institutional member is any public or private higher education institution or agency that supports and furthers the goals of the Association. Institutional members may include up to fifty (60) Professional memberships and one hundred (100) student memberships. Cost is $3,000.00 annually. Please email [email protected] with the complete list of members for your institution.